(Cusco, Peru) Each year the InterCLIMA initiative, led by the Ministry of Environment of Peru (MINAM), brings together technicians, specialists, businessmen, officials and decision makers in order to address the issue of Climate Change (CC) as well as to create a annual meeting place for exchange and management-reporting on CC. Its priority is to focus on how CC should be integrated into governmental development planning and investment priorities of Peru. 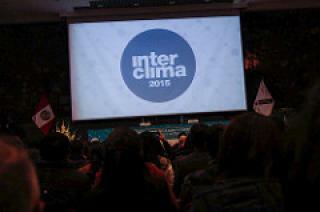 The third annual meeting of InterCLIMA was held this year on October 27, 28 and 29 2015 at the Convention Center of Cusco.The three-day event was to generate a platform for civil society, academic experts, the private sector as well as the different levels of the Peruvian government in order to show progress in the management of CC as well as point to the challenges, needs and priorities identified during the process. This year InterCLIMA elaborated the expected results in the form of presentations, panels and workshops a part from featuring a project fair for participants to inform about different projects in Peru and Latin America, focused on the theme of national contributions (iNDCs) to CC adaptation. The events slogan of this year “La contribución nacional de la agenda climática al desarrollo: Bosques que valorizan al país”, (The national contributions to the development of the Climate Change agenda: Forests increase the value of the country), introduced the main topics CC planning, its institutionalization, stakeholder engagement in the processes, as well as tools, methodologies, practices and funding of CC adaptation. In various panel discussions and presentations, impacts of CC on Peru, its people and natural environment were made clear, as well as governmental programs with the goal to adapt and mitigate to CC, presented to the audience.Furthermore did the speakers point out challenges in the progress of CC adaptation. So it was mentioned in the plenum discussion following the presentation by José Luis Ruiz concerning “the methodology for the design and identification of the states of facilitating factors of financing climate” the issue of connecting and distributing responsibilities for implementation and financing of projects on different governmental levels (national, regional, local). Furthermore was emphasized in a following presentation on the topic “Issues and guidelines for funding of iNDCs of Peru” how financing and donors for adaptation processes for Peru were available, however, the challenge consisted in distributing those means to the respective responsible location. In an elaboration and following penal discussion on the Landscape approach and policy instruments of the agricultural industry, the importance of agriculture and forests was emphasized, as those sectors were heavily affected by CC but nevertheless crucial to securing the alimentation of the country. It was further mentioned that regional governments were to be more prepared and their agricultural sectors has to be strengthened to ensure future alimentation. Lastly, not only in the presentation by Marco Llanos on the national program for forest conservation in favor of CC mitigation, was the significance of the countries’ forests highlighted. The fight against deforestation, so Llanos, was already carried out by a great number of players, which among the regional governments, NGOs and local indigenous communities also include the private sector. The latter, however, had to become more active in order to prevent deforestation. The speaker suggested the launching of seals of quality, which were bound to certain production regulations (such as in this case engagement in the fight against deforestation), in order to provide a practical incentive for companies to become more active in forest conservation.